NO TEAM will go undefeated AND win the Super Bowl. Now to more pressing issues. Is Tom Brady not playing in the preseason a major concern for the defending AFC Champion Patriots? Clearly. An aging defense aside, if Tom Brady misses any significant time during the regular season, the Patriots are D-O-N-E. Like the Colts if Manning's injury doesn't clear up fine, the Colts will be D-O-N-E. Some teams can survive with their backup quarterback, even win some games, the Patriots and Colts aren't those teams. The Patriots have some issues but all ribbing aside, they still have the best coach in the league and the best quarterback in the league (we could debate that, but I'll let it be). Fortunately for them, not even Teddy Bruschi at 40% of what he was three years ago can change that. The only thing that could change the Patriots odds is a little Matt Cassel action. The former Trojan backup to Carson Palmer & Matt Leinart has about as much experience starting NFL games as I do. Despite what you think of Dante Culpepper, he's played with #81 and he's won with #81, and if the Pats are undefeated when Brady goes down, who do you feel more comfortable with? Brady may be sick of answering questions about his more than questionable injury but the only way to solve that is to P-L-A-Y. (I love spelling out words, it adds an intangible). I won't devote any more time to neither Jim Sorgi or Matt Cassel, because like I said before if either one of them is in, the Colts & Pats are D-O-N-E. Does it matter who is starting in Arizona? Matt Leinart or Kurt Warner, the truth is Arizona will probably hover around .500, miss the playoffs or get bounced in the first round. Their head coach is feuding with star wideout Anquan Boldin, they have an aging backfield led by Edgerrin James, I'm sure adding a quarterback controversy to the mix is just what the doctor ordered. Start Leinart, tell Kurt that the grocery store is missing their bagger. Where will Brett Favre carry the Jets? I know Brett may not be in the prime of his career and the Jets may not exactly be the best team in the AFC, but it wouldn't' surprise me one bit to see them in the playoffs in 2008. Why do I think that? They have one of the easiest schedules in the league. Aside from road games against San Diego, New England, and Seattle the Jets play teams they should beat. Miami and Buffalo have more problems than a math book (been dying to use that one) and playing Oakland, San Francisco, and Tennessee away from the Meadowlands doesn't exactly pose a big threat. Favre has something left in the tank, more something than say Chad Pennington. Bottom line, a team that went 4-12 a year ago has acquired a Hall of Fame quarterback, has spent about $100 million in improvements and got handed a schedule which should give them another 6 wins. I don't know if 10-6 is good enough to get in, but it's close. 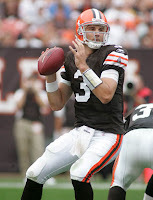 Will the Browns duplicate their 2007 success? How does an emphatic NO sound? Browns fans, as you know I'm a schedule guy, and unfortunately for you, your schedule is ridiculous. The Browns play the NFC East as their NFC divisional opponents. In the offseason, no division in the LEAGUE got better than the NFC East, a conference which placed (3) teams in the playoffs in 2007 and one in the Super Bowl. In the first four weeks of the season the Brownies get prime time home games against Dallas and Pittsburgh, then they follow that up with road games at Baltimore & Cincy, traditional tough places to play. While the Giants defense has weakened somewhat, the Browns get them and the Redskins in back to back weeks to start off October. If those 6 games weren't tough enough, my pick to win the AFC welcomes the Browns in week 8, the Jags. After the first 7 games of 2008 you may just be looking at a team that has won as many as 2 or 3 games. To run the table just to get to 10-6 may be impossible especially when you play at home against Indy and on the road against Philly and Pittsburgh. Sorry Brownies. How good are the Dallas Cowboys? You won't find many people to argue that they don't have the most talent in the NFL, the real question is, how good WILL they be? The Cowboys have the best quarterback in the NFC, they have the best receiver in the NFC, they have arguably the best running back in the NFC, and then there is their defense. Dallas added veteran linebacker Zack Thomas to the 9th ranked defense in the league in 2007. The Cowboys had the 3rd most sacks in the league (46) lead by DeMarcus Ware (14 Sacks) and Greg Ellis (12.5 Sacks). Inside linebacker Bradie James returns to the Cowboys with his (101) tackles in 2007 and veteran strong safety Roy Williams seems to have improved his footwork in the offseason and looks to add to his tackle total in 2008 (2007, 92 Tackles). This team was 13-3 in the regular season last year and even with the loss of running back Julius Jones, the Cowboys have gotten even better adding super Arkansas RB, Felix Jones through the draft. If the Boys can get anything out Pacman Jones, rookie Mike Jenkins it'll improve on their less than stellar secondary. The Cowboys are going to be good and it'd shock everybody if they didn't break through this year and win a playoff game or too. It's no secret I'm picking Dallas to get to the Super Bowl, and with all this talent it shouldn't be a secret to you either. Defensive ROY: Patriots linebackers have a way of playing a tad over their head while under Belichick. Rookie LB Jerod Mayo should fall in suit. Has had some quality preseason games (seven tackles against the Bucs) and with veterans Vrabel, Bruschi, and Harrison & Lynch behind him, Mayo should be allowed to make some mistakes that can be disguised. I like Jerod Mayo as the Defensive ROY if only because, I HAVE NO IDEA WHO TO PICK! Offensive MVP: Don't worry, I'm not picking Romo. I'm doing this begrudgingly, I'm an admitted THIS GUY hater. Everyone loves him though, Brett Favre. Favre is the quarterback of a team that will win a significant amount of games more than they did the previous year. A team that went 4-12 will have a pretty good turn around and probably end up in the playoffs. Uncertainty around Peyton and Tom's injuries, the career ending injury to Charger linebacker Shawn Merriman, and the AFC West being terrible, clearly leads to a Jets run in the playoffs. Favre will get all the credit, the same way he did during the emergence of a nasty Packer defense and Ryan Grant in 2007. Barring a repeat performance by Tom Brady and Randy Moss, Favre will get an MVP in 2008, promptly sending all Packer fans to the hospital. Defensive MVP: Cowboys DE, DeMarcus Ware. Ware is headed to another level in 2008. With 14 sacks in 2007, Ware was a automatic Pro Bowler, like I said before, add Tank Johnson, Pacman Jones, Zack Thomas, and Mike Jenkins to an already top ten defense, Ware will be unleashed. Call me a homer, but who else are you picking? Jason Taylor? Marvin Lewis won't be coaching the Bengals in 2009. Shawn Merriman won't be playing by October 1st. Troy Smith of the Ravens will surprise some people. Tarvaris Jackson is leading nobody to the NFC Championship. Again, I have no idea what will happen with the Washington Redskins. The first Wild Card team from the AFC will be the Indianapolis Colts. They still have Reggie Wayne, Peyton Manning, and Joseph Addai on offense. Despite Harrison being a little bit older and less healthy, the Colts can score points, they'll lose a few games but make the playoffs. Bob Sanders & Freeny back, these Colts can play and have alot left in the tank. The second Wild Card in the AFC, this is how I figure in the New York Jets. They won't overtake the Patriots this year, it just isn't going to happen. Thomas Jones will have a bounce back year, former Steeler Alan Faneca boosts an offensive line that has struggled, and 14-year veteran full back Tony Richardson gives Favre even more protection from the backfield. Expect receiver Jerricho Cotchery to have a M-M-Monster year. Either the Packers or the Vikings are getting in as a Wild Card the other will get in as the NFC North Champ. To think the Packers will completely implode is a little rash but to think the Vikings behind Tavaris Jackson will win the division, I'm a little hard pressed. I'm going to go with the Minnesota Vikings just because of the Jackson theory. Peterson plays behind the best offensive line in the entire league, Bryant McKinnie & Steve Hutchinson. They struggle at receiver, top wideout Bernard Berrian, but not many teams are strong at that position. I like the Vikings here but I could also see them missing completely and this spot going to the Eagles or Redskins. I hold a Wild Card spot for Jon Gruden and the Tampa Bay Bucs. Tough loss last year at home against the Giants in Wild Card weekend. Possibly the most veteran bunch of receivers in the NFL, Ike Hilliard, Joey Galloway, and Michael Clayton. Fortunately their veteran but efficient quarterback Jeff Garcia doesn't make bad decisions. Cadillac being injured doesn't look good but the you can count on the Bucs to make up for that deficiency on defense. Barber, Hovan, the ageless Derrick Brooks, and Phillip Buchanon headline a quality defense and oh yea they drafted possibly the best corner in the draft, Aqib Talib. The AFC East champs will be the New England Patriots. Hey they are the Patriots and they do have the best quarterback in the league, remember Tiger didn't do so bad on one pin at Torrey Pines. AFC North champs, I'm going with the Pittsburgh Steelers. Emergency blanket for Willie Parker, Rashard Mendenhall. Big Ben gets his tall wideout who will have a monster year in 2009, Limas Sweed, but could come on late for the Steelers. Santonio Holmes and Hines Ward are both healthy this year and will give that Steelers team an even more balanced offense. Their defense is as always, solid. AFC South champs, the Jacksonville Jaguars turned it on late last year and will continue. Garrard came on strong and in his first full year as the definitive starter, expect big things. Jerry Porter is out of Oakland and in Jacksonville with Troy Williamson to give Garrard a few more weapons. Jones-Drew and Taylor bring back a dominant backfield again. This team is ready to roll even with top draft pick, DE Derrick Harvey sitting out almost the entire preseason. The Raiders, Chiefs, and Broncos are all sub-par and the Chargers just have that much more talent. The AFC West belongs to the San Diego Chargers. Despite an injured Shawn Merriman, the Charger defense is nasty. Corners Cromartie, Jammer, lead an defensive group that led the NFL in interceptions last season. Castillo and Olshansky put enough pressure on the quarterback to cause those picks and allow them to overcome the absence at some point of Merriman. The NFC East will be won by the Dallas Cowboys. I think I've told you that before. Expect somewhere in the neighborhood of 12-4, 13-3. Barber and Felix Jones will have monster years. NFC North champs are going to be the Green Bay Packers, if they aren't, the fans may be looking for the closest ledge. I like Driver and Grant to elevate first year starter Aaron Rodgers. I also like that defense returning a veteran mixed group that was dominant last year. The NFC South will be won the New Orleans Saints. Last year was a 'BRING ME BACK TO PLANET EARTH' season for head coach Sean Payton and Drew Brees. Adding two New York studs, former Jet Jonathan Vilma, and former Giant Jeremy Shockey will give the Saints a better dimension on both offense and defense. Will Reggie Bush please show up? Next to the AFC East and the Pats, has any other division belonged to one team like the NFC West belongs to the Seattle Seahawks as of late. The Seahawks benefit from playing along the likes of Arizona, St. Louis, and San Francisco. A dominant home field advantage (7-1 in 2007) and adding rusher Julius Jones should improve their backfield. The lack of wideouts on the Seahawks could be the only thing that derails the Seahawks, we know it won't be their Tatupu led defense.